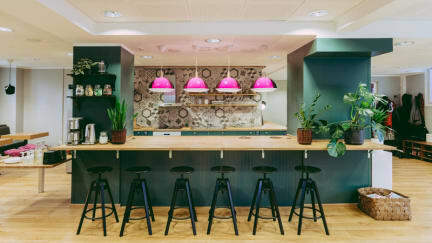 Myö Hostel is a brand new boutique-hostel just a few kilometres from the center of Helsinki, in the charming Ruskeasuo district. Although our location is central and well connected, we are surrounded by a lush Finnish forest and a beautiful residential area. You'll sleep even better in our uniquely designed rooms knowing that Myö Hostel plays it fair. We offer jobs for people with disabilities and do our best to make the working world more inclusive for everyone. Guests are welcome to use our modern and well-equipped kitchen. In our cozy and stylish living room you can read, play games, work on your laptop, meet new people – or just chill away! We have our own little garden, where depending on the season you can soak in the sun or make snowmen. Twice a week we offer our guests a Finnish sauna experience. Our guests can use the laundry room for a small fee. Meeting rooms, an auditorium, a sauna department, sport facilities and catering services are also available on request. Our hostel is right next to the Central Park of Helsinki, although we would describe it more as a forest. We are at a quiet residential area with great public transport to the city center. We are located near the main street of Helsinki; Mannerheimintie. There are many buses and a tram going to the city center from Mannerheimintie. There is a small supermarket approximately 100 meters from the hostel, as well as a 24h supermarket on Mannerheimintie, approximately 500 meters from the hostel. 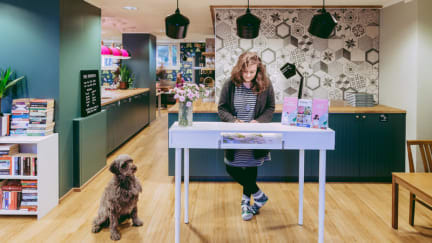 We have 19 individually designed rooms, so each visit to Myö Hostel is different from the other! Doesn’t matter if you’re travelling with family, friends, pets or by yourself – we have the perfect room for you. The price of our rooms includes: WI-FI, Breakfast, Towels and linens, Soap, Hairdryer. We have private rooms for up to 4 people. Most rooms have a private bathroom with a shower. We have dorm rooms for 4 and 8 people. Our sturdy bunk beds with curtains guarantee a good night's sleep. Each bed has a quality mattress and linens, a reading light, a power socket and a locker. The attached shared bathrooms are recently renovated and always clean. We also have accessible rooms – please contact the hostel and make sure we have one available during your visit! Payment upon arrival by cash, credit cards, debit cards. We prefer cards to cash as we have a very limited amount of change. We have a 24/7 on-call phone. Our staff is mostly available on the premises from 7-15. I only stayed for one night, but I wish I'd had more time here! The hostel is located somewhat in the woods, and it seemed like a very safe and beautiful area to hike. Despite being alone, I felt very safe in the area, even walking back from the bus stop at night. The hostel itself was very clean and the facilities were well-kept. My bed was comfortable and the room was very cute-- and it had a nice view of the trees! Breakfast downstairs was also very satisfactory. I highly recommend Myö! This was easily the best hostel I have ever stayed in. Not only was the location in a beautiful forest (great for nature-lovers), but the place itself was cozy, cute, welcoming, and generous. Staff was extremely kind and helpful, and breakfasts were full and delicious. I almost want to go back to Helsinki to stay in this hostel again; it is lovely! This is a very pleasant hostel that we enjoyed very much. It is very clean and the staff are wonderful. Really nice hostel, very clean, comfy beds, good breakfast, towels included even in dorm rooms. The staff are only around at breakfast time (you check yourself in) but were friendly when I saw them. It is a quiet hostel (there were only a handful of people staying there) and the location is out of the way. It does have good connections to the city centre though, and if you arriving to and from the airport I don't think it is a problem. Great english book exchange!! This hostel is really nice, very clean and neat and the staff are very friendly and helpful. It has no real friendly vibe, it’s a much older crowd with families and older singles. The cleaning staff do an amazing job and everything is sparkling, almost like a hotel. Location is what let’s this place down, as it takes about 30 minutes to get to Helsinki city centre by bus, and they’re not too frequent, if you’re a solo traveller looking to meet other people, it’s probably not the best pick.